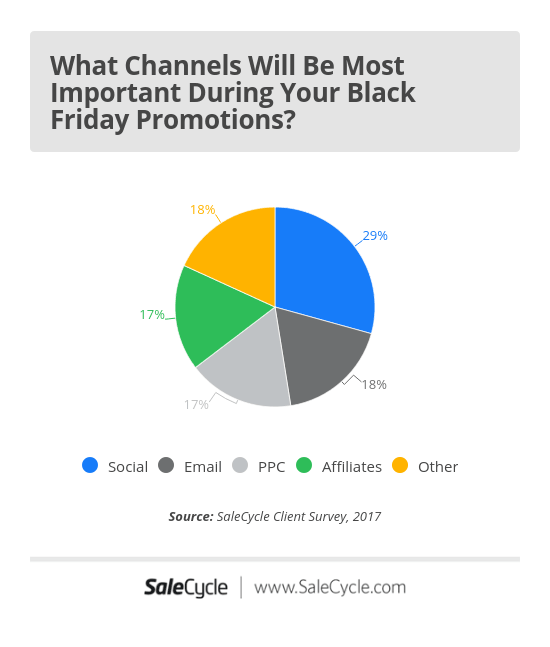 A SaleCycle client survey finds that the majority of retailers will be participating in Black Friday this year, and many now see it as more important than Christmas for driving sales. 42% of UK retailers viewed Black Friday as more important than the Christmas shopping season, compared with 30% from the US. 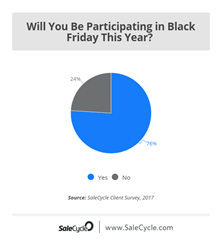 With Black Friday fast approaching, SaleCycle has surveyed retailers in the US and UK to find out their views on Black Friday, and its importance for retailers. Our survey found that 76% of retailers will be taking part in promotions around Black Friday and Cyber Monday this year. 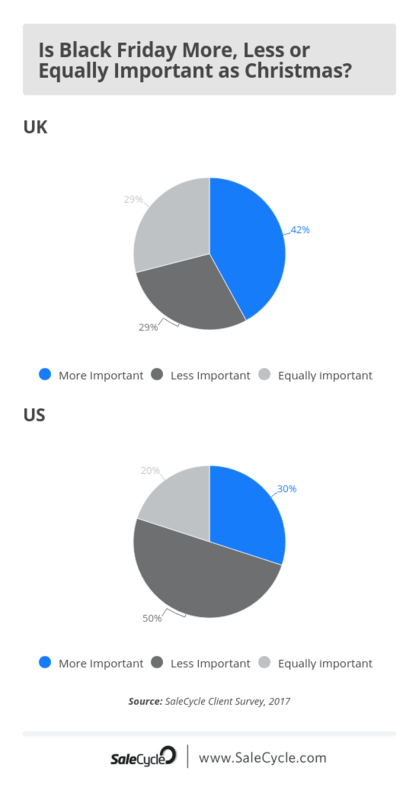 The results vary between the US and UK, with US retailers more likely to take part in Black Friday, with 83% saying they would. 30% of UK retailers said they wouldn’t be discounting. While the Holiday shopping period lasts through December, retail traffic is more concentrated around Black Friday and Cyber Monday, making it a bigger single event. For many retailers, Black Friday weekend is the biggest sales period of the year. Some retailers told us they drive up to 15% of annual revenue on Black Friday online. Some retailers now see Black Friday as more important than Christmas, with so much traffic and sales compressed into a four day period. 42% of UK retailers viewed Black Friday as more important than the Christmas shopping season, compared with 30% from the US. Many still see Christmas, with its longer run-up period, as the event that frames their retail year. Some fashion clients, for example, see greater volumes of sales as people buy gifts nearer to Christmas. Since Black Friday comes so near the beginning of December, it’s hard to separate it from the Christmas season in general, and this weekend of deals essentially gets the holiday shopping season started. The Christmas shopping season is longer, and while there are sales peaks, none reaches the height of Black Friday or Cyber Monday overall. Last year sales volumes peaked around the 14th December, but Black Friday volumes were three times higher, and Cyber Monday’s around twice as high. With so many customers, online and offline, looking for deals, few retailers feel they can afford to ignore Black Friday. Founded in 2010, behavioral marketing company SaleCycle helps businesses create better customer journeys online. SaleCycle uses behavioral data to help optimize conversion rates, recover abandoned sales and increase customer lifetime value. The end result? Increased online sales. With offices in the USA, UK, France, Singapore and Sydney, SaleCycle fuels the growth of over 500 companies, including the likes of Ralph Lauren, IKEA and Virgin Atlantic.